My apologies if this topic has been explored in threads elsewhere. I recently took my newly-purchased used Osprey on a one-week flatwater trip. I'd experimented a little with different paddles before the trip, and settled on a short, light favourite ottertail single blade and a 240 cm Aquabound double-blade kayak paddle I use when paddling wide folding kayaks. The double blade quickly became the paddle of choice on the lakes, regardless of wind and waves (or absence thereof). I moved the sliding seat forwards and backwards, and experimented with a seat pad. I suspect that double-blading would be better, especially in wind and waves, if the seat were mounted considerably lower. Lowering the seat, however, would put the height uncomfortably low for single-blading, especially from a kneeling position. I know recent Osprey models offer the option of a "Combi-seat". That seems like a good concept, but not designed to switch techniques "on the fly". I'd like to have both paddling options accessible at all times. I wonder how an assymetrically shaped hull, i.e. the Osprey, would perform paddled from a position closer to the bow, but facing the stern and paddling backwards as one typically does when paddling solo in a tandem canoe. One would, therefore, have two seats at the ready each ostensibly facing the other. A veritable courting canoe, without the elegant madame occupying the bow seat. A sad thought, I know, and possibly heretical. I opened the door on this idea, though, after recalling what a worker at the factory warehouse of a large (and excellent) Canadian canoe manufacturer told me when I'd asked about soloing one of the assymetrical tandem models which was not equipped with a kneeling thwart. He confidently claimed that one would never notice the difference when paddling the canoe with the almost imperceptibly wider half in front of the paddler rather than behind him. The second seat wouldn't displace cargo space as the heavy canoe pack rides in the stern behind the canoe seat and the lighter pack would ride behind the back of the rear-facing kayak seat. Any thoughts on paddling assymetricals "backwards"? I do realize that it's quite probable that the 48 hour deluge and the lack of imminent paddle expeditions are wreaking havoc on my imagination. The stern is not flared as the bow is.. The Osprey has a very flared bow for waveshedding. Swede form boats can be paddled fish form but you will notice that the skegged stern impedes turning a bit. Shear is taller in the bow. You will have lots of wetness coming over the stern if you make that the bow. Whoever told you that you wont notice the difference was full of BS or thought you to be just another dumb customer. Would have sworn to have contributed yesterday, but it isn't here and no notice from our masters...?? Lowering an Osprey's seat will increase stability but impede paddler bio-mechanics. As the seat lowers a point is reached where the double blade forward stroke becomes more horizontal and less effective, transitioning into left and right side sweeps. Lower seating also serves to shorten the forward strokes distance. An additional seat height issue is Osprey's relatively high sides amidships. Hands, elbows, etc will eventually bark unpleasantly on the rails. Osprey is a Swede Form hull with differential rocker. The long, gently tapered bow theoretically moves water out of the hulls path more gently. Running it backwards makes it a Fish Form hull and will increase drag and wave making resistance, slowing forward speed. Reversing differential rocker causes handling problems. The minimally rockered stern meant to resist yawing force when trailing is now pushed forward against the water and will resist being drawn to either side to maneuver. The highly rockered former bow is now aft, for a significant reduction in tracking. The new bow will stick, the new stern will skid and the paddler have a deuce of a time maintaining directional control. un-named factory guy doesn't. Best to leave well enough alone; paddle the stable tripper with a double stick sitting high, preferably with added footpegs for stability and bone to boat connection. Paddle it with the single blade of choice sitting or kneeling. Thanks for your replies, LRC and Charlie. Your observations re: the impracticality of exchanging bow for stern on the Osprey are appreciated. Thanks for saving me time and effort in that direction. I took the boat out yesterday and experimented with a raised kayak seat placed just in front of the sliding bow seat in its most rearward position. I also rigged the seat to be easily deployed as a seat-upon-seat lumbar support when sitting up on the canoe seat. It stores easily on top of the canoe seat and acts as a thin bum pad when not deployed. It only weighs around a pound and I suspect I'm going to really appreciate having it along on trips. I like the multi-use aspect: bum pad, lumbar support when paddling seated on the canoe seat, and as a lower seat position closer to canoe-centre when wind, waves, or fatigue warrant it. My aim is to incorporate elements of my closed cell foam portage system with enhancing versatility in the seating. Charlie, I believe you that under most conditions, the factory specified canoe seat height of the Osprey is close to optimum for accommodating both single and double blading. 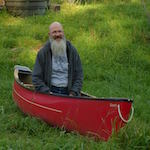 My biases, though, are influenced from paddling old Tyne and Klepper folding kayaks with both single and double blades. For those boats, my cockpit fit is much enhanced by raising the seat a good 2'' with a thermarest-style inflatable cushion when double blading, and adding yet another two inches+ of air when single blading with the rudders deployed. I just love the versatility of those boats. I just finished another trip, a 12-day solo in Temagami, into Wakimika, Hortense, Dorothy, Naismith Creek, Chapin, and Beaver__beautiful country!__ but came home this time determined to make a mod to the Osprey seat. I really like the boat, especially when paddled with a double-blade. I paddled fairly often, also from a seated position, with a short bentshaft single blade, alternating sides every 4-10 strokes. What I didn't like in this boat was paddling her from a kneeling position with a straight-shaft single blade. I've nearly always got the sliding seat in its most rearward position. Feels right most of the time. Doesn't feel right with hearty winds from behind and following seas. And single blading with a straight stick with "Canadian" strokes hasn't felt right from the get-go. Home again, I decided to re-locate the sliding seat aft by 4 inches, which, of course, meant drilling new holes in the pretty ash gunwhales. Oh well! Done! I'm waiting to test-drive her and want to focus on kneeling using a straight stick, paddling empty and with light loads. Years of paddling tandems solo from the bow seat probably have something to do with my discomfort over the "too close to centre" feel of the sliding seat. I'm hoping that kneeling from a few inches further back will make my corrective strokes more efficient, i.e less correction, and less switching of sides. In any case, the sliding seat will still allow me to return the seat to the boat's centre balance point for carrying. The Osprey isn't really designed as a switch paddler. There is a fair amount of rocker in the bow, and although the asymmetrical design does contribute to easier tracking, it is not one of those no-rocker rockets that will respond well to switching sides. I'm not sure what the seat setting are from the factory, but I put the front of my seat about 10 inches back from the center of the canoe. The Osprey can have a tendency to broach in stern winds, but that can be a matter of load too, and can be offset with good correction strokes. I put many thousands of kilometers on my Osprey, all with a single blade. I would ditch the ottertail and go with a sugar island type of blade, you might find correction more efficient, although I never found the Osprey to be a hard canoe to make go where I wanted it too. I built a new one a couple of years ago, but due to the weight that I've gained in the last five years, I found it too small to carry my fat and a load of gear. That double blade stuff is out of my realm of experience, although I know one lady who I helped build an Osprey with seems to enjoy the double blade in hers. Stern down is the way to go in stern winds. But the bow will wave in headwinds if you are far back. Also a sit and switch stroke needs to be finished AHEAD of the center point of the canoe. Most people carry it way too far back.. Anything carried in back of center induces yaw. Make sure you are not following the gunwale in your stroke and never get your hand in back of your mid thigh while applying power. All canoes tend to broach in stern winds. It is possible to do hit and switch in an Osprey.. Bow Rocker really has nothing to do with it working. Again hit and switch works best with a stroke well ahead of center. It takes practice... lots of practice.. I am always amazed when folks give themselves five minutes to try something rather than the five hours needed. I bet your paddle shaft is not vertical, you have a bit of a sweep following the gunwales, you carry the paddle too far toward sternward. All that does is maximize the need for correction strokes. We just had a tripping symposium in the Pine Barrens of NJ. There is barely 20 feet between river twists and its only one to two canoe widths ( not lengths) wide down there. One fella had an Osprey.. not a problem Later on on a lake he did speedy hit and switch. Worked fine. But Jim has been practicing many hours. He has not fiddled with the seat. He has fiddled with himself. Any canoe will respond to sit and switch. I use it in my WildFire with 2.5 inches rocker bow AND stern. Took practice and time and not getting flustered.. Now I have it down. I certainly don't disagree with the application of proper strokes to achieve maximum efficiencies. However, there are quite a few of us who are not there, and might not ever get there. In this case, hull design makes quite a difference. For instance, the J. Winters Barracuda that I built, when paddled switch style would hold a straight line considerably longer than my Osprey would. I don't think John designed the Osprey with hit and switch in mind, and although I'm only guessing, I would think the Barracuda was designed with exactly that in mind. If hull shape didn't matter, we'd all be paddling the same canoe. Its true the Osprey is a general purpose boat for traditional tripping and was designed to go ahead. Not fast but friendly. Thats why it has a skegged stern for tracking. Its way more about the paddler and the paddle than the boat Most people focus on one facet of the boat and not investigate what it can really do. Properly sized there really is no need for more than one solo..
As far as the getting there... it just takes a day to make a discernible difference. It was great fun working with brand new soloists this last weekend. At the end of the day all were really pushing the boat to find out what else they could do with it. But it was a day of focusing on boat obedience and behavior. Tripping the focus of course is getting there. But its worth while to go play on a pond and just "Mess around in your boat" at home. Properly sized there really is no need for more than one solo. Sez the lady with how many boats in her shed? <3 (I'm not one to talk - I just added another sweet solo to the stable last week). Last edited by SteveBoal on October 20th, 2015, 7:02 pm, edited 1 time in total. Thanks RHaslam, LRC, and Charlie Wilson for your input. Such a wealth of experience here. Frankly, I'm in awe of anyone who builds boats commercially or otherwise. Hell, I'm happy with myself if I can just drill six holes in four places on the third try! New to me: 1) any notion whatsoever of correct form of hit-and-switch that I will try to be conscious of, and to practice, next time out. Thanks, LRC. 2) "Sugar island" blade: I googled them and recognized them as extra paddles which I have hanging around at home here, usually thrown in on deals made on used canoes I've bought, and which are mostly on the long side for me when soloing. 3) Wow, 10" back of centre sure seems to leave a lot less boat in front of me! 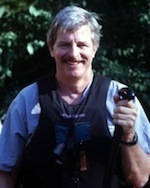 It's great to learn from people who have lots, or, for that matter, even a little, structured or traditional background in canoeing: camps, training, courses, clinics, associations, etc., activities most of which I never perceived as options for me, and if they ever were options, would have scared the living j-stroke out of me! All that "group" stuff! Mine is typically the curse of the self-taught: I have, surely, developed paddling habits that are counter-productive and that, through years of repetition, have become fossilized. I rarely dwell on that fact, though, because I've been so fortunate to be able to indulge freely and frequently in this wonderful activity. This forum is a priceless resource for me, and I thank the people who share so much here of their experience and passion for paddling. I'm continually testing out your ideas and trying out techniques, and looking forward to the next outing. I have an osprey with the fixed cherry seat and I just took it to the factory to have the kayak seat (combi seat) installed like the kee 15. I'm worried now about what you said Charlie of the amidships being high for a lower seat position and less efficient double blade paddle strokes. But wouldn't that apply to the keewaydin pack canoes also?. The height and width are almost the same for the kee 15 and the osprey around the seat area if I'm not mistaken. Do you think the kayak seat (combi seat) like the one on the kee 14 and 15 will work the same way on the osprey? Nope, the pack canoes have lower gunwales and are designed for using a double bladed paddle from a low sitting position. Perhaps not quite as low as a kayak but pretty close. According to the swift website the center depth of the kee 15 pack is 12.5" and the ospreys is 12", isn't that the gunwale height? Last edited by Mags on July 5th, 2017, 3:40 pm, edited 3 times in total.